“Wandering Impatiens” shows beautiful flowers growing and spreading to their fullest bloom is a wonderful expression of color and natural beauty. I was inspired by the colors of all the “Wandering Impatiens” flowers and the way they all were blooming touched so beautifully by the sun. This lush art was painted with layers of Acrylic and Oil paint to bring out the beautiful contrast and light as seen in the original. I love the light pink tones with fuchsia since those are my favorite colors. I create a pencil sketch to scale before I start all my paintings and after four months of painting I noticed that this pastel painting is one that you can turn in any direction and the composition will look good. My signature on the lower right side is the correct view for this painting. Both the Original Framed Pastel Painting and this Re-creation of “Wandering Impatiens” stretched canvas capture the matching natural twisting and turning of the flowers with the suns goodness always looking fresh and exciting. This art is a wonderful site to see as a focal point. 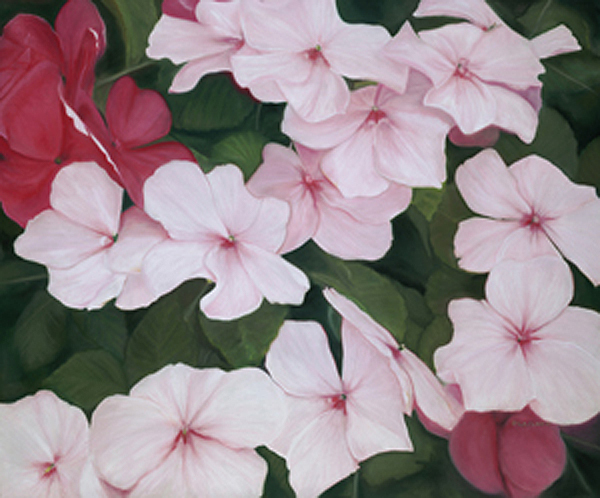 This Archival Digital Fine Art of “Wandering Impatiens stretched canvas captures the original and measures 30″ X 36” and needs no frame since the design continues on all sides. This is a splash of color for any room, over a love seat or any focal point where you want excitement. If you have any questions please contact me directly.